It's no secret that millions suffer from osteoporosis. But new research suggests the disease and an early marker for developing it may be significantly more widespread than previously believed. As many as a third of Australian adults may have brittle bones and are at risk for debilitating fractures. Dr. Mark Kotowicz, an endocrinologist, associate professor at Australia's Deakon University School of Medicine and a principal research fellow at the University of Melbourne, suggested that the number affected in the United States and the United Kingdom would be similarly staggering. Perhaps most surprising was the number found to have a low bone density condition called osteopenia, a potential precursor to osteoporosis. 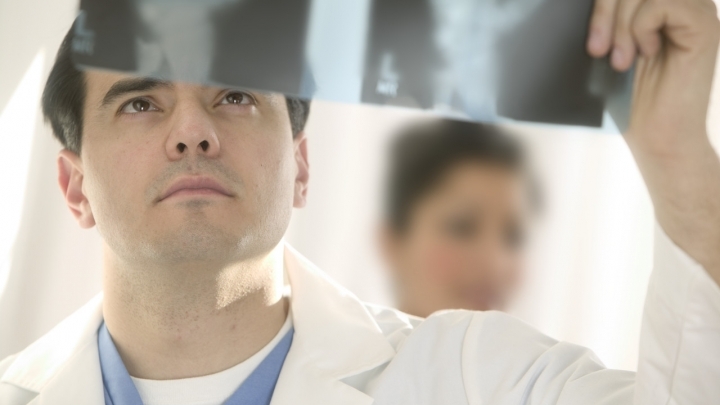 "The prevalence of low bone mass was somewhat higher than anticipated," Dr. Kotowicz said. "The World Health Organization suggested a bone mineral density threshold for the diagnosis of osteoporosis that was meant to identify approximately 30 percent of postmenopausal women, and our data are consistent with this. The prevalence of osteopenia has not previously been documented in this way to my knowledge, and three to four times as many men and women have a reduced bone mass that is associated with an increased risk of fracture." The research was based on estimates of bone mineral density scans and blood tests in more than 3,000 men and women over the age of 18 in Australia. Of the study participants, almost 25 percent of women over the age of 50 and 6 percent of men were found to have osteoporosis. Though plenty of studies have looked at osteoporosis, few examine the prevalence of osteopenia. Osteopenia was found to be most prevalent among individuals between the ages of 55 and 79. Even among the youngest age group of study participants, those between the ages of 20 and 24, some were found to have low bone mass that could later lead to osteoporosis. It was found that 16 percent of men and 21 percent of women in that age group suffered from osteopenia, while 1 percent of women were found to have osteoporosis. Those percentages were found to grow substantially by age group. In participants over the age of 80, 19 percent of men in that age group suffered from osteoporosis while 58 percent were found to have low bone mass. In women over the age of 80, 51 percent were identified as having osteoporosis and 43 percent were found to have osteopenia. Previous research has suggested that osteoporosis is a major health threat for 44 million Americans, or 55 percent of individuals over the age of 50, according to the National Osteoporosis Foundation. An estimated 10 million Americans currently have osteoporosis, of which 80 percent of those affected are women. Osteoporosis, which occurs when the bones lose density or mass, is rarely identified until a fracture is discovered. According to the National Osteoporosis Foundation, even tasks as simple as sneezing or bumping into furniture can cause bones to break. Those who are at the highest risk for developing the disease include those with a family history of osteoporosis and those who do not consume enough calcium and vitamin D. Other factors including a lack of exercise, smoking, heavy drinking and kidney disease also can contribute to developing osteoporosis. "The high prevalence of low bone mass likely reflects Western sedentary lifestyle and dietary habits. Adequate calcium, nutrition, maintenance of adequate vitamin D levels and regular physical exercise may reduce the burden of osteopenia and osteoporosis in the population," Dr. Kotowicz said. Low-fat or non-fat milk, yogurt and cheese can easily provide calcium.Getting enough calcium is important for those with osteoporosis because if your diet does not contain enough calcium, it will be taken from your bones, notes the National Osteoporosis Foundation. Incorporating vitamin D is important because it aids your body in using the calcium. This is usually easy to find in milk and even fortified cereals and breads. It is best to avoid salty foods for those that have low bone mass, osteoporosis or believe they may be at risk because consuming a lot of sodium causes your body to lose calcium, which can lead to bone loss. Eating healthy food such as high amounts of fruits and vegetables also can contribute to bone health, though the reason is not clear. Osteoporosis or osteopenia is commonly diagnosed with a bone density scan of the hip and spine using dual energy x-ray absorptiometry. Diagnosing the disease can help physicians better monitor patients who may be more likely to suffer bone breaks and falls. Many patients also benefit from taking medications to prevent, slow or stop progressive bone loss. High risk groups, predominantly men and women over 70 years of age should ensure they receive bone density scans. Dr. Kotowicz suggests a range of additional patients also at risk get scanned including: women with premature menopause, patients with a history of thyroid hormone excess, those treated with glucocorticoid medication, anticonvulsants, anti-estrogens or anti-androgens; patients with chronic kidney disease, chronic liver disease or malabsorption syndromes as well as those with a family history of osteoporosis. Additional tests could be needed such as blood work, x-rays and a vertebral fracture assessment. X-rays are often needed for patients who appear to be shrinking, or losing at least half an inch in height a year, have a stooped or hunched posture or have back pain. Patients who have lost more than an inch and a half from their height also may need an x-ray. However, the earlier it is diagnosed the sooner a patient can begin treatments to slow or halt the bone loss since the disease can be difficult to diagnose before a fracture or bone density test because a person cannot feel the loss of bone that may be occurring. National Osteoporosis Foundation, "About osteoporosis"